Contact to set up private lessons. Your spine has two invaluable functions: supporting your body weight and protecting your spinal cord. Due to the shape of our spine, daily habits and shallow breathing, we often suffer back pain or injury and rounded posture as we age. Practicing regular lengthening and strengthening of our spine and back keeps our posture optimal and our body healthy, and knowledge of the safest ways to do this is essential. Learn about the anatomy of your spine and the best ways to open up, starting with the basics with some advanced variations offered to move securely into deeper backbends. 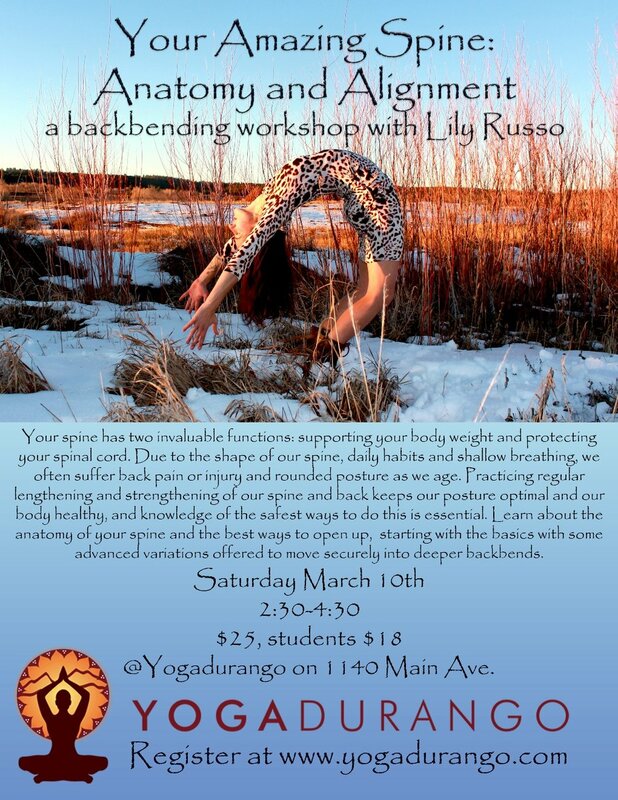 Saturday March 10th, @Yogadurango on 1140 Main Ave. The Gayatri Mantra is a popular chant in yoga classes all around the world, and rightfully so. It is one of the oldest and most repeated prayers and carries a powerful message and dedication to the path of bringing your highest potential to light. Learn the words and meaning and practice chanting this powerful mantra. A weekend of total rejuvenation, this women's spring cleanse retreat includes yoga, meditation, a kitchari cleanse, Ayurveda education, a cooking class, and lots of self-care. Lily Russo will facilitate yoga twice a day, classes on Ayurvedic self care routines, Abhyanga, and how to make kitchari, the wholesome, delicious Ayurvedic meal. A class on how to make Kitchari, so you can continue your cleanse at home and add a new easy and wholesome meal to your repertoire of recipes. One shared room at Sophia Retreat Center for 2 nights and all activities and meals during retreat. Non-refundable deposit for the Spring Cleanse Women’s Retreat. Balance of $225 due by May 15th. Special Offering: Sign up with a friend and you’ll both receive a $30 discount. For an additional $5 off, pay by cash or check (preferred). Payment plans available. Email lilyrusso@gmail.com for instructions on payment. What is kitchari and what is a kitchari cleanse? A Kitchari cleanse is an Ayurvedic diet that removes toxins, clears the liver, brightens the skin, and leaves you feeling nourished and satisfied, rather than deprived and hungry. Kitchari is a complete meal of basmathi rice, mung beans, spices and vegetables, with toppings of cilantro, lime, avocado, and ghee. It is easily digestible and gives the digestive organs a break so they can rest and refresh themselves. What is Ayurveda? Ayurveda means the knowledge of life in Sanskrit, and it is a sister science to yoga. It is an integrated and holistic system of health care that has evolved over thousands of years. It looks at all elements of a person's life: physical, mental, emotional, environmental, and genetic, to get to the root of health problems and bring about optimal and vibrant health based on an individual's unique constitution. Will we only eat kitchari all weekend? We will eat kitchari for lunches and dinners. In the mornings we will eat delicious oatmeal with fruit and honey (optional). It is suggested to forego coffee to assist your cleanse, however coffee will be available by request at breakfast, Herbal teas will be offered throughout the day, and coconut herbal chai will be served for dessert. Will I feel satisfied eating this way? This kind of cleanse is fulfilling and nourishes us on many levels, physically, emotionally, and spiritually. Rather than feeling hungry as in some juice or liquids only cleanses, a kitchari cleanse is easy and pleasant and you can eat until you’re satisfied. I am vegan/gluten free, can this retreat support my diet? This retreat is vegan and gluten free friendly, with dairy options. What is the lodging like? We will be staying at the mountain retreat Sophia Retreat Center, located in the mountains of Dolores, Colorado. The large, wooden lodge is spacious and beautiful. The rooms are comfortable and lovely. Retreat fee is based on double or triple occupancy in each room, with your own bed. Each room has its own bathroom. Nearby on the grounds is an enchanting labyrinth to walk. During free time you can explore the many trails of nearby Boggy Draw Recreation Area. Can I share a room with a friend? Yes, please make mention in your registration form to be placed in a room with your friend or family member. Isn’t the kitchari cleanse supposed to be at least 3 days? Yes! The kitchari making lesson will prepare you to complete one or more days of kitchari cleansing at home. Every participant will receive a recipe. Dive deeper into your yoga practice. This comprehensive 100 hour immersion will take you on a journey of personal transformation as you study the many facets and gifts of yoga. Facilitator Lily Russo will guide you to dive into yoga studies beyond the hour and a half yoga class setting, develop your own personal practice, and connect with the other students in your training. Special Guest Instructors include Ayurvedic Specialist Amita Nathwani, Kirtan Musician Cheryl Birchard, Ayurvedic Practitioner Sheryl McGourty, Lynn Wickersham teaching the Chakra system, and Meditation/ Empowerment Guide Oliver Scott-Tomlin. Investment: $1100 paid in full by December 1st. $1200 after December 1st. Payment plans available. $300 deposit due with Registration to secure your place. Some partial scholarships/trades available. Location: Studio 10, Smiley Building, 1309 E. 3rd Ave. Durango, CO.
Time and Dates: 10am-5pm, Jan 12 and 26, Feb 16, March 2, 16, 30, April 13, 27, May 11, and May 25. 60 hours contact time, 40 hours assigned readings and homework. Beginning after the first class, students will begin a daily home practice Sadhana in each time period until the next class and asked to write a reflection for each one. "Lily's classes are beautifully designed to nurture and transform the whole being. They can be physically challenging but also balanced, playful and inspiring. Lily is humble, open and heart felt in everything she does. She really cares about her students and welcomes everyone of any ability to share in her passion of yoga. Her classes have helped me to embody my life in a more authentic and meaningful way and I'm so grateful! " "As international teachers and travelers, we can’t keep track of the people who skitter in and out of our lives. Some encounters are short, entertaining and casual, such as a chat with tourists who heave their oversized backpacks in the corner of the fruit shake shop and share their travel stories. Other encounters have an enduring impact. In this post, I introduce you to Lily Russo, a yoga teacher who visited Vientiane recently and changed my life. When we returned to Laos after our month-long winter break, I received an email from the Vientiane Yoga Studio saying there would be a guest teacher for the next couple weeks. After just one class with Lily, Tony and I both developed a big crush. Colorful feminine tattoos devoid of dark outlines embellished her arms – rainbow finches, symbolizing her parents and her brother, on one arm, and elegant blooming flowers on the other. Her soothing voice offered specific instructions to attain proper alignment in the asanas while making each person in the class feel like we were doing everything just exactly right. Her vinyasa-flow-style classes challenged us to find our edge, to focus on the breath, to revel in our strength and flexibility. Energizing music, often lyrical takes on traditional mantras, accompanied her practice. Emerging from shavasana at the end of each class, I always felt happier and more relaxed than I did at the start. For three weeks, I didn’t miss a class with Lily. I also caught myself chanting softly and practicing pranayama (breathing exercises) at school. I felt joyful and light, even when faced with life’s daily frustrations. Patience, not usually an attribute assigned to me, suddenly came quite easily. A week after Lily’s departure, I still feel the inner peace she brought to our hectic little city. My history of on-again off-again yoga obsession suggests I’m unlikely to maintain that gentle connection. But I hope I can." 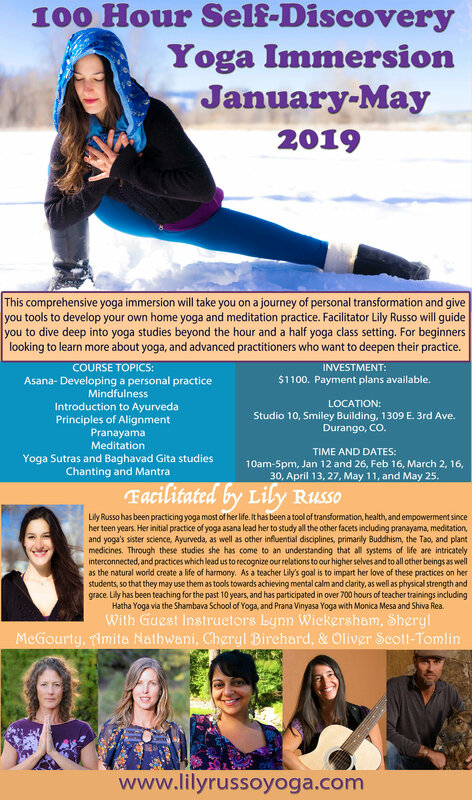 Lily Russo is one of the most integrated yoginis I have ever met! She walks the talk in every way, has a beautiful and embodied practice, and is a gifted teacher. Her dedication to the path of yoga and conscious living has impressed me and is an inspiration for anyone she crosses paths with. Private yoga with Lily is hands down the best yoga experience I’ve ever had. Every single class is unique and specifically designed to help you to build strength of both body and mind. Her loving spirit and beautiful soul combined with a lovely soothing voice is something I look forward to weekly. Thank you Lily for teaching me yoga!! Email lilyrusso@gmail.com, visit my Facebook Page, connect with me on Instagram, or use the Contact Form below.